Over 1000 years ago, Persian poet Ferdowsi wrote his masterpiece "The Shahnameh", i.e., The Book of Kings, containing tales of great adventure and larger-than-life characters and creatures from remote kingdoms in a world where dreams and nightmares coexist. 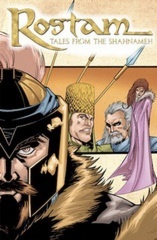 Hyperwerks has produced the world’s first modern comic book adaptation of the Shahnameh. This book has received an international award (see below) and is now part of a series. 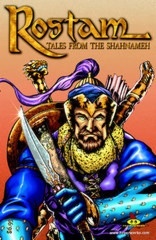 The Tales from the Shahnameh features Rostam, a powerful hero, and his many fantastic adventures where he demonstrates his strength and skill as a warrior, his integrity as a man of honor, and his loyalty to his country. He protects and defends his country against foreign invaders, political betrayal within the royal court, and demons of the underworld led by the Great White Deev! So Far, Three titles have been published and the Comic book series has been featured on Voice of America, BBC, and a host of other publications. The Rostam Comic Book has been added to the Libraries of prestigious Universities such as: Harvard, Syracuse, UCLA, UC Davis, San Jose State, UT Austin, and a number of Public Libraries. Book 1, Ferdowsi's most famous story: The tragedy of Rostam and Sohrab. Winner of Golden Lioness award (World Academy of Arts Media & Literature) in Budapest, Hungary. 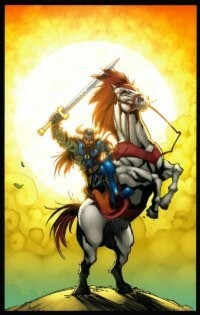 Book available online at the official site or in select book stores or Amazon.com.